Disneyland Tickets will be $200 by 2028. The good news is that you you can go this year for $92. The other day I ran across my old ticket stub to Disneyland. It was from 2001, marked $43. Wow, I thought, "They've gone up!" How fast have they gone up? Well, after writing about trips to Disneyland in 2011 and 2013, I thought I'd like to find out. Before I launched a grass-roots campaign, I checked wikipedia. Sure enough, the article for Disneyland had all the ticket prices starting from back in 1983. WHEN DISNEYLAND WAS $10.50! Here's the graph, showing the annual rise in ticket prices to Disneyland. Now, hold onto your phone, because there's an associated chart you need to see. As you have probably surmised, if the ticket prices keep going up, this has an effect on demand. Fewer people will be willing to go to Disneyland as the prices continue to rise. But the price isn't smashing demand yet! Even with consistent annual increases in ticket prices, attendance is STILL GOING UP! 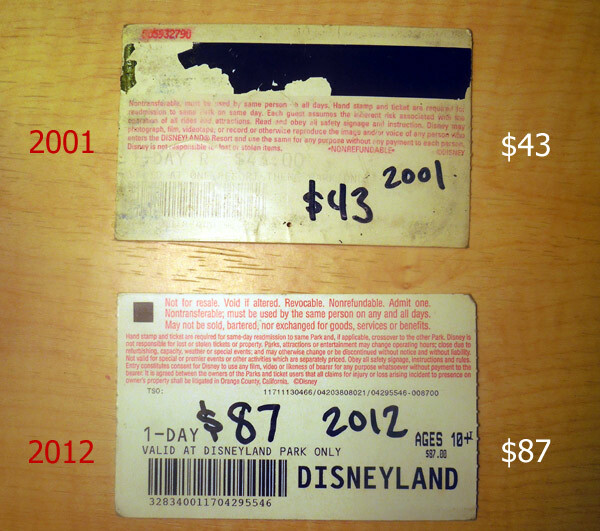 Given that information, I predict rising Disneyland ticket prices for many years to come. The price probably won't jump so much that it gains much attention or bad press, just a slow, steady rise. Plotting the history of price increases, a trend showed up, outlining a $4.50 average increase over the last decade. Continuing that trend, the price will be $124 in 2020 and $146 in 2025. The graph above shows annual increases from between $4 and $6, ending at $183 in 2031. That green addition to the graph above doesn't look quite right. It is too straight. History shows that the ticket price hikes are accelerating! So, here is another graph, charting a ticket price which not only continues to grow, but which continues to have larger and larger annual increases. I predict a $5 increase next year, and a $10 increase from 2025 to 2026. If the predictions which helped craft this graph are correct, Disneyland tickets will pass the $200 mark in 2028. I hope the future offers a cheaper alternative. Maybe by then I'll be able to download and print my own copy at home.